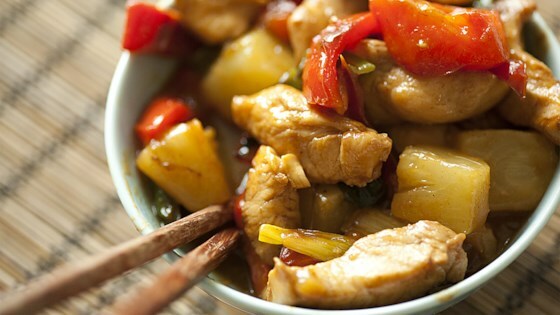 "An easy weeknight dinner, this quick chicken stir-fry with pineapple is as delicious as it is colorful! Serve with rice for a complete meal, or fried rice for a treat. Add red chile flakes to the mix if you want something sweet and spicy!" Tasty kabobs for those summer evenings! You can also use a large skillet instead of a wok. Loved it. Easy to prepare. Used fry pan as I don't have wok. On;ly addition I made was to add mushrooms. Very delicious. Will make again for sure! It was really good. And my husband liked it too! Made it just like it said. Very good. Will do again. Very simple and easy! Used crushed pineapple because I grabbed the wrong can. Was EXCELLENT!! Didn't change a thing, great recipe!